Have you learned about the four primary buyer archetypes? Maybe it's time you did. Treating people the way you want to be treated is the wrong way to do business -- at least if you are in sales. Now, that phrase may bring you up short. But just think about this a moment . . .
"You never want to treat prospects the way you want to be treated. You want to treat them the way they want to be treated": That's the premise and philosophy that Dustin Hillis and Steve Reiner present in their new book, Navigate 2.0: Selling the Way People Like to Buy. Navigate, a system designed and developed by the global sales coaching firm, Southwestern Consulting, is based on helping salespeople to understand the four primary buyer archetypes. Fighters: Fighters are cut-to-the-chase, bottom-line drivers with little time and less patience. They are motivated by results, and it’s important to them to be in control. They are fast-moving and value tasks. Entertainers: These include social butterflies and enthusiastic extroverts. They love people, possibilities, and rapport -- and they may care more about emotions than facts. Detectives: Detectives are the practical analysts. They are always on the hunt for details, tend to have a slightly slower pace because they are methodical and rank the value of facts over emotions every time. Counselors: These are the laid-back diplomats. They are “Steady Eddies" and have the interest of the team at heart. They love security and consistency, and they make decisions by consensus. Each of these types of prospective buyers needs to be treated differently, if you want to increase your chances of making the sale. If you're trying to set an appointment with a Fighter on the phone, use the phrase, "The reason I'm calling is," because that keys-in on their natural desire to get to the point. Contrast that with approaching a Detective, where you might instead say something like, "Our latest data shows that switching to _____ can reduce expenditures by x percent. I’d like to talk through a few specific details about this. Do you have five minutes?" Here, using numbers and referencing logic speaks directly to the Detective's brain, which functions something like a mental calculator. Or, if you're selling to an Entertainer, he or she is likely going to be influenced by whom else you've done business with. Meanwhile, a Counselor is going to be more influenced by how long your company has been in business, your status with the Better Business Bureau and the testimonials of other real-life people. "Most salespeople only effectively sell to the prospects who are of their own same behavioral profile -- missing out on a majority of buyers," says Dustin Hillis, co-founder of Southwestern Consulting: "But if sales professionals can learn to adapt their selling style to go to the other person's buying style, then they are likely to close up to three times as many sales,"
So, how do you know whom you're talking to? 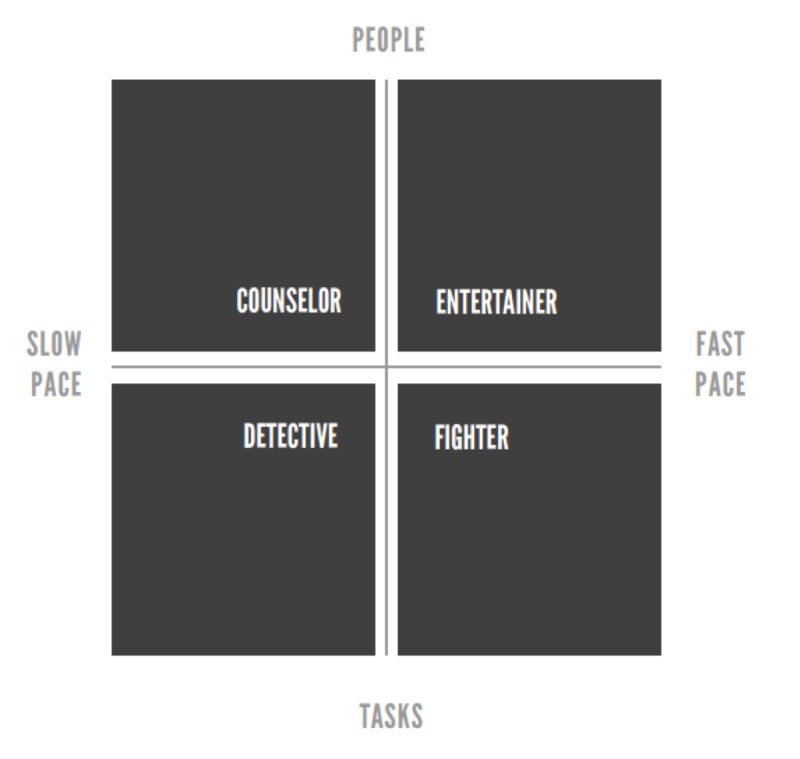 Each of the four archetypes has a number of different "tells" that you can key-in on to give you a quick insight into whom you might be speaking with. While these may seem like over-generalizations, it's surprising how accurate they can be. Clothes: Typically, Entertainers wear vibrant, noticeable garments and jewelry because appearance is a piece of how they express themselves to the world. Detectives, in contrast, may be neatly pressed, ironed, tucked in and well put together, but they likely to be less trend-setting in their approach. Handshakes: If someone squeezes the crap out of your hand when you first meet, chances are you're dealing with a Fighter, who can't help but have physiology influence his or her subconscious desire to demonstrate power and control. In contrast, when you offer your hand to a Counselor, don't be surprised if you get the "limp-fish" handshake in return. A Counselor might also do the classic "smile, head nod and turn" without even making contact with you, because he or she is typically more subdued when it comes physical touch. Office environments: If everything is perfectly straight, organized and in order, which type do you think you're dealing with? Yes, most likely you're facing a Detective or someone with strong Detective tendencies. But if the person's office looks like a bomb of sticky notes exploded around Empire State-looking buildings of loose leaf papers, he or she might be an Entertainer. Tone of voice: Even the way someone sounds can tip you off as to whom you're dealing with. Fighters aren't afraid to speak loudly, slowly and directly. Counselors generally speak quietly and slowly. On and on it goes, and there are lots of other indicators: These range widely, even to the type of car this person drives. What's more, these archetypes probably sound familiar. You’ve met them all before, in some shape or form, and a few of them have most likely driven you up the wall in the past. That's because most of us don't naturally connect with behavioral styles unlike our own. "The most challenging situations are when you're selling to, working with, or even living with someone who is 'cross quadrant' from you. They both deliver and process information completely differently than you do," says Steve Reiner, a partner at Southwestern Consulting and the original brain trust and creator of the Navigate system. It turns out that everything from the amount of details a person shares to even the way someone sounds when he or she talks, can completely change the trajectory and likelihood of a sale ever taking place. The typical responses for most of us during these conflicts is to either press harder, speak louder or say the same things over and over again, continuing to communicate in the same way we've already done. Alternately, we might just dismiss the person as "not worth it," and move on. In both scenarios, the natural state for most of us is to default to whatever communication style is most comfortable for us, and not adapt. But expecting our listener to modify his or her communication to our own style is not only lazy but a sure-fire way to lose business. As it turns out, in the river of sales, just as in the river of life, there are those that fight the current. There are also those that float along aimlessly. And then there are those that win: The Navigators.